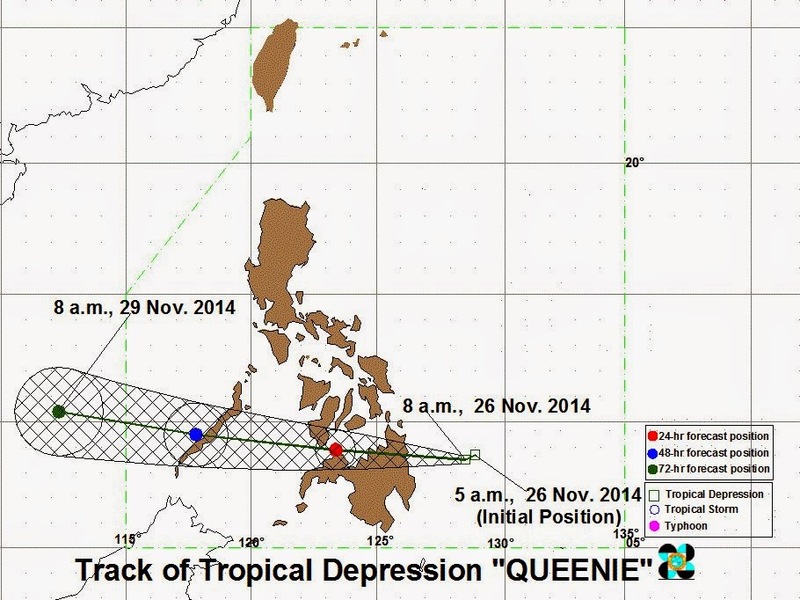 UPDATES: Typhoon Queenie intensifies and now signal no1. raised in Cebu and other parts of Visayas and Mindanao. Classes are suspended by DepEd officials (November 27, 2014 Updates) in Southern Cebu. CLASSES SUSPENDED THIS AFTERNOON. Classes this afternoon (Nov. 26) in all levels in all Schools in Cebu South are suspended. This announcement was given by Dr. Arden Monisit, DepEd Provincial Division Superintendent. Public Storm Warning Signal No. 1 (Winds of 30-60 kph is expected in at least 36 hours). At 7:00 AM today, the center of Tropical Depression “QUEENIE” was estimated based on available data at 260 km East of Hinatuan, Surigao del Sur or at 310 km East Southeast of Surigao City(8.7°N, 128.8°E). Maximum winds of 45 kph near the center. Forecast to move West Northwest at 25 kph. Signal #1: Southern Leyte, Bohol, Southern Cebu, Southern Negros Oriental, Southern Negros Occidental and Siquijor, Surigao del Norte including Siargao Island, Surigao del Sur, Agusan del Norte, Agusan del Sur, Davao del Norte, Davao Oriental, Compostella Valley, Dinagat Province, Camiguin, Misamis Oriental, Misamis Occidental, Bukidnon and Zamboanga del Norte.